Do you feel like quitting your blog? Are you tired and discouraged? You are not alone. I almost quit my blog due to burnout. In this post I’ll share my story and some ideas to help you keep going as well. Does the thought of writing in your blog have you cleaning the house instead? Are you doing just about anything to avoid working on your blog even though it is something that’s important to you? Do you find yourself saying things like “this is pointless?” Do you get down on yourself when you think about your blog? It is possible you are experiencing burnout. When I started this blog, I had a ton of energy for it. I spent every day after work and all hours of every weekend working on the blog. I spent time learning about blogging, writing blog posts, optimizing my posts, creating social media images, and any of a million other things that are important for a blog. Suddenly I hit a brick wall. It was as if a literal wall was put up in my mind that made it nearly impossible for me to move forward. I felt discouraged and like it all was pointless. I felt tired all the time and as if all of the money and time I’ve spent has been a giant waste. The thought of writing a post left me feeling like a failure because I just couldn’t get myself to do it. These are telltale signs of burnout. I felt exhausted, depressed, discouraged, and detached. I found it hard to care about anything when it came to the blog. I felt like going to bed right when I got home from work. I felt my blog was pointless, I wasn’t helping anyone, and I had no energy to keep going. My motivation was GONE. Can you relate to these feelings in your blog or in whatever other goal you’ve been working toward? Burnout typically comes on gradually. It isn’t like you wake up one day and feel burned out. But it can feel like you wake up one day and can’t do it any more after all the other days before it piled up. This is where I was. I knew I was tired. I knew I was discouraged. But I kept telling myself to keep going and work harder, learn more, and eventually things would fall into place. This was a mistake. I just got more and more exhausted and felt helpless to change. The key is to notice yourself going down the path toward burnout before you get to the point of feeling like everything is impossible. Do you feel more tired? Do you feel like it is harder to do things you normally like to do? (Interestingly these are also symptoms of depression). Do you find yourself having more negative, discouraging thoughts? Rather than just trying to work harder, these are signs to step back and evaluate what is going on. Made me want to swear at them to be honest. 800 pageviews per day times 30 days is around 24,000 pageviews a month. 25,000 pageviews a month is a goal many bloggers are working toward because of a requirement for acceptance into a higher paying ad network. Needless to say, I was not at 800 pageviews a day, even after WAY longer than 4 weeks. I became frustrated, angry, resentful, and depressed. I struggled with negative self talk. I found myself getting stuck in thoughts about being defective in some ways. I felt there was something wrong with me. I felt very alone, like everyone else was more successful. I couldn’t even get myself to do the things I knew I had to do to be successful. (Example, I haven’t emailed my people in at least a month 🙁 ). 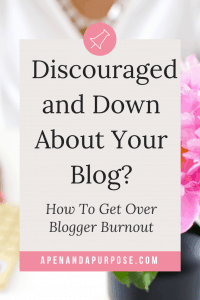 Feeling depressed, burned out, and resentful toward others does not lead to positive blog posts! How do you come up with ideas when you can barely think about your blog without feeling sad and loserish? (I love that loserish seems to be a word since there are no red squiggly lines under it). The first thing to consider to reduce burnout had to be whether to give up the blog. I didn’t want to do this, but had to make sure it was for the right reasons. I’ve spent a lot of time, money, and work to get it where it is. Giving it up felt like a huge loss. But, thinking about it this way isn’t helpful. In the business world all of that stuff is a “sunk cost,” meaning it is spent whether I have a successful blog or not. It is like the person who gambles. “I already put $100 into this machine, I need to keep putting money in so I can get my money back.” That’s not how it works. If the only reason you are staying with your goal is because you don’t want to lose what you’ve already done, well…that’s not going to work long term. You would say exhausted because you wouldn’t be doing it for a good reason. Since burnout includes both physical and emotional exhaustion, the key to reducing burnout is to reduce exhaustion in these areas. But how in the world do you do that when you are trying to work toward a goal that requires you to keep doing the thing that seems to be causing you physical and emotional exhaustion? Great question! Here are some things to do to reduce burnout when you are already there. Reduce or eliminate things that increase negative feelings. For me, this involved spending less time looking at Facebook groups where I could run into posts that trigger comparison mindset for me. I also found I needed to stop listening to podcasts and trainings about blogging for awhile because it was causing me to feel negatively toward myself. I felt that although I was doing the things I was learning, I wasn’t making the progress I wanted to make. Take a Break. Taking a break is essential. When I told myself I just had to work harder, it made things worse. Because I did work harder, but still had no real progress. It was exhausting. You need to take little vacations from work even when you feel like you shouldn’t. When you are in the midst of burnout you likely aren’t going to do great work anyway. Reconnect with your why. This is what keeps me going. Why are you working on a blog? Why are you working toward losing weight? What is the reason that you keep doing the hard work? Is it still important to you? If not, stop doing the thing. If it is still important to you, remind yourself of why you are doing it. Write all this stuff down, keep it in your journal or make a poster to tape to your wall. You need your why on days when it is hard. Self Care. Self care is the key to avoiding burnout and is also key to getting out of burnout. Get enough sleep, eat better, exercise, and generally take care of yourself. Do things you enjoy doing. Take a break, step away, have fun. Although the hours I spend doing cross stitch do not bring me closer to blog success, they actually do because they allow me to feel refreshed and ready to get back into my blog. Have Fun. What are the things you like to do that have nothing to do with your goal? Do those things. I pulled cross stitching back out which is one of my absolute favorite hobbies. I’ve also been listening to fiction and comedy books and podcasts. Connect With Others. The other day on Facebook someone wrote a small (wonderful) rant about how annoyed she was that everyone seemed to be bragging about accomplishments all the time which was discouraging to her. I say this is wonderful because I think we need to be more honest about our pain when things aren’t going the way we want them to. It was brave of her to write this and feeling that connection helped others (like me) going through similar experiences. Connect with other people who are genuine and supportive. Connect With Friends. Similar to above, connect with people who care about you. Do things other than work. When you are around other people who value you, it can help you get out of defining your worth based on the one thing that isn’t going right in your life. Think Differently About Your Work. The way we think is our reality. Spend some time working on your thoughts since this will help you make progress. Mindset is important. Maybe you need to reframe what you are doing somehow. Maybe you need to look at the progress you made so far rather than expecting to make the same progress as someone else. Maybe you need to look at your why and see if your definition of success matches what you are striving for. You can reduce the likelihood of burnout happening in the first place by focusing on self care. Know you can’t do all of things. Prioritize what matters to you, especially those things that bring you joy. Keep doing your hobbies, keep having fun. Create a schedule for yourself so you allow yourself time away from working on your goals. These are some ideas for reducing the likelihood of burnout. Comment and share what you’ve done to reduce or avoid burnout and keep going on your goal. Burnout is hard to get through. I am still struggling with burnout, but am committed to doing what I have to do to get through it. I’m allowing myself more flexibility with the blog. I’m going to try to let go of perfectionism and just be me. And now, though this post is nowhere near perfect, I am going to finish it up and publish it. Although it’s vulnerable, I’m also going to ask you to share it with others. No one talks about this. I hope my putting this out there will help someone else. The goals we’ve taken on are hard. If they weren’t we would have just given up on them. Please share this post with others. Thanks. Great ideas! I also feel better when helping others. With blogging you spend so much time by yourself that it feels like you’re alone after awhile. Thank you so much for your comment! What a wonderful read. I can connect with all the feelings laid out in this post. Most definitely when it comes to COMPARISON! I’ll be sure to keep your helpful suggestions in the back of my mind, actually in the front of my mind! I needed this. I’ve felt burnout with previous jobs and I know the warning signs well. My current job is really demanding, I struggle with caparison syndrome for my blog as, and want to be doing more for the blog at a faster pace. This week I’ve felt the symptoms of burnout rearing their ugly heads and I swear this post was a sign for me to slow down. I just want to say thank you for talking about a subject that many people don’t talk about. You’re welcome! Slowing down helped me a ton.